Heart Two Heart with Dan and Ann is meant to ignite and inspire the listener to take their relationship with God to a new and deeper level. We want to explore with you subjects that are often skipped over and ignored but which add a rich dimension to humanity. We will unpackage and unravel such mysteries, maybe for the first time, most of which are found in our bibles. We will explore why the church is struggling to thrive in today’s society and what needs to change; the mystical teachings of ... See More Jesus and Paul and men of recent past history who have made a difference in this world. We’ll discuss modern-day miracles, the destruction that resentment has in our lives and in the church and the importance of speaking our truth in love. We will discover that we are unique aspects of God and as Jesus said of us, “you are the Light of the world”; and that we were destined to be ONE with Jesus and the Father today, not tomorrow, “for the kingdom of God is inside you and is at hand”. We are advised by Paul of the bible to “let this mind be in you that was also in Christ Jesus” and by Jesus himself to “not marvel at the things that I do, for these and greater YOU will do”. When? We are told that “In the latter days… your sons and daughters will prophecy, your young men will see visions and your old men will dream,” but when? We believe in miracles – today – do you? These and many other such topics will be explored with you. If you have a question, curiosity, mystery, miracle or a story to share with us about your own individual experiential journey with God, you may be a good fit to be on our show and we hope to hear from you right away. 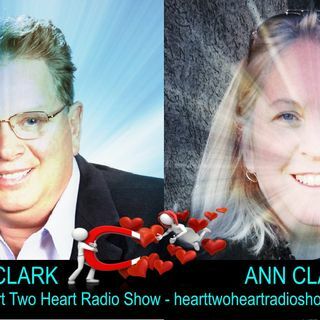 Explore without fear with Dan and Ann on Heart Two Heart. H2H - A.J. Cannon-Dalbey - You Can Change Your World One Thought at a Time Starting NOW! H2H: Dan Clark - Did God Know His Creation Would Fall? H2H: Dee Kuhre - What's Wrong With Our World?